New This Year We are always trying to improve our site and here is where we tell you what we have done. We have tried to make our entrance flatter, we are still up a hill in the Peak District, so there is only so much we can do! We have also tarmacked the main touring and static fields. At the suggestion of the AA we have installed a brand new chemical disposal point and we have also improved on our already popular dog wash! New for this year all of our Deluxe Lodges feature a log burner to make them extra cozy. 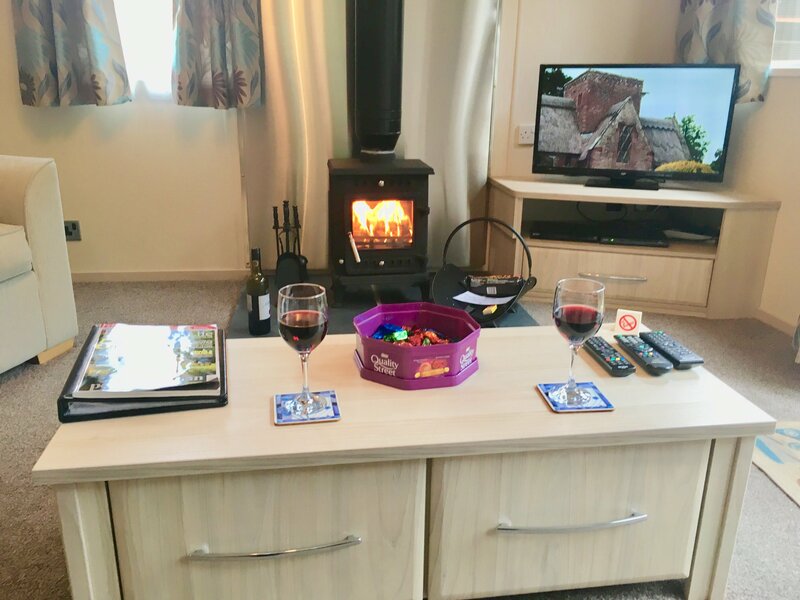 Whilst staying in our Damson, Elm, Lavender or Maple Lodges you can curl up with your special someone and let the world go by whilst watching the flicker of the flames. We have made a few changes to the our reception. Firstly changing the floor, secondly by adding ‘doggy corner’ for all of your fury friends needs and thirdly we have added a freezer so you don’t have to leave the site to get a meal. As part of a continual repair and renewal program we have re-done the decking on the Hawthorne and Ivy Lodges. We have also put brand new gazebos on the decks. All of the lodges will benefit by having the new gazebo before the end of this season.